Walking the off-beaten path: 4-H: Do your kids participate? Have you thought about encouraging your children to join 4-H? Have you thought about volunteering to be a leader or project adviser for 4-H? Every county in Indiana has a 4-H club, and there is so much to be learned and gained from participating in 4-H.
Last weekend we had our first Parrish Grover 4-H meeting. The girls were excited, and Tink even took along her phone for the sole purpose of taking notes! A true 4-H meeting is run by the club members. It's a great way for these kids to learn organization, preparation, planning, responsibility, and the practice of Parliamentary Procedure rules. As we talked about up-coming lessons and demonstrations for these meetings, I loved to hear the older members excited about working with the younger members on shared presentations ranging from electricity to photography to beef projects. At the end of the meeting, Miss Carrie had an activity to share, the building of Ecobots. 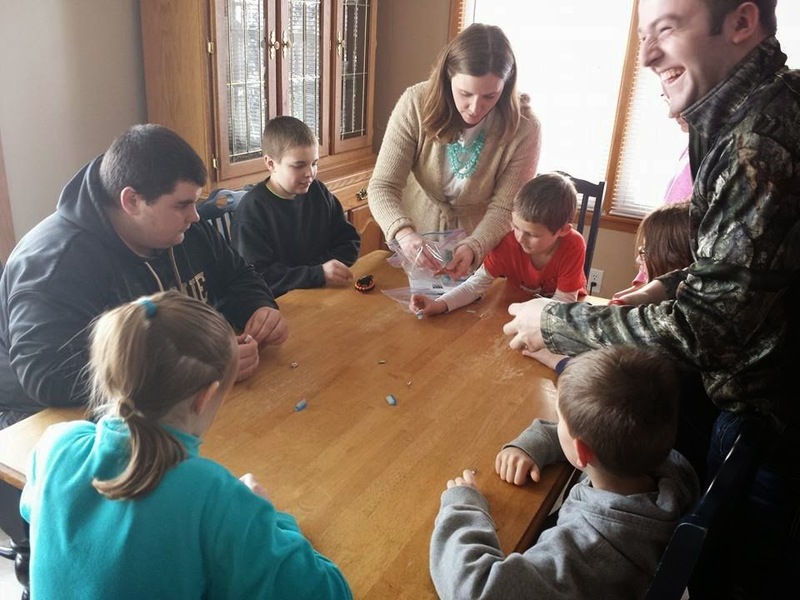 Our county's Purdue Extension office has a variety of projects to share during meetings, and this one hit it off BIG with our kids. This lesson revolved around the idea that a spill of some kind had endangered the ground, and it needed to be contained. What did the kids have to work with? The head of a tooth brush (FYI: use FLAT bristled brushed instead of wavy ones!). a tiny simple motor, a small round battery, and some double sided foam tape. Rice and straws used for the spill and containment area. 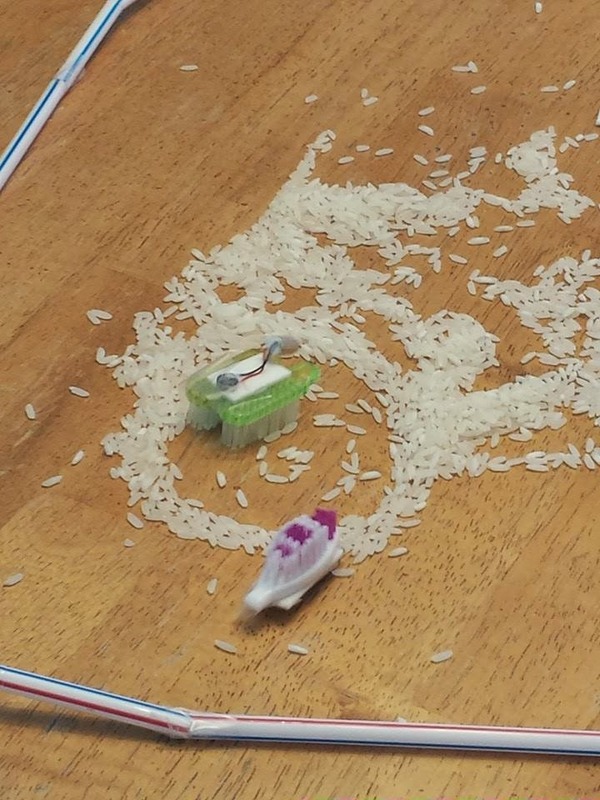 The kids had to figure out how to hook up the battery to the motor and then to the flat of the toothbrush. Did you notice in the picture above that one ecobot was made from two brush heads and scoots around on bristles while another scoots on its back? It's all good. 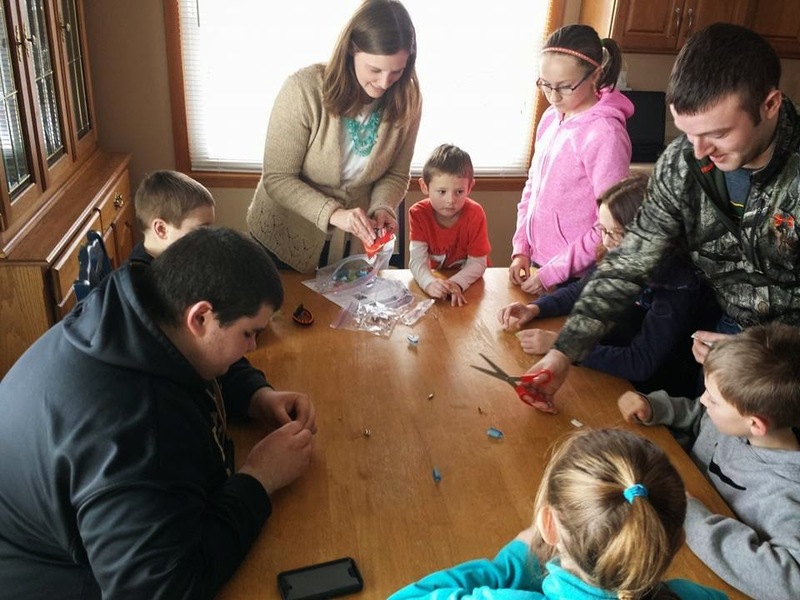 As you can see, the kids had a blast, and some ended up thinking outside the box to make their ecobots more powerful by creating a double head and battery bot! I have to tell you that our girls LOVED this lesson. Miss Bear is still hooking up her little motor to any battery she can find. Because of this inquisitiveness, she learned that the tiny round battery does not put out near the energy of a 9 volt. It was pretty funny to see her face at that moment! I do hope that you look in to participating in your local/county 4-H program. Even though the online deadline for enrollment has passed here in Indiana, you can always fill out a paper enrollment form at your county Extension Office. Here is a link to Indiana's 4-H project list. With the extensive number of projects your kids will be challenge and learn while having fun. Thanks Susan! I think 4-H is so good for all kids, and it helps them develop leadership skills that will go with them the rest of their lives. Have you thought about encouraging your children to join 4-H? Have you thought about volunteering to be a leader or project adviser for 4-H?- yes! I like very much.